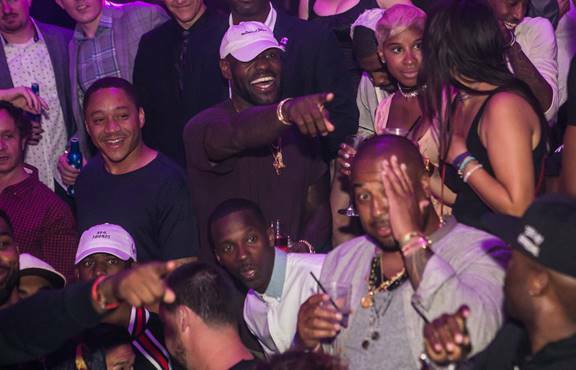 LeBron James celebrated his NBA championship Monday night at Marquee Nightclub in The Cosmopolitan of Las Vegas. The Cleveland Cavalier began his night at Beauty & Essex in the restaurant’s private dining room, The Jewelry Box, where he had dinner with a group of friends. After dinner, LeBron and his entourage headed to the nightclub where he made an over-the-top entrance. The UNLV Marching Band played “We Are the Champions” as they accompanied the NBA star down a red carpet through the pool deck area. Fireworks lit the sky as he made his way into the nightclub. Once he entered the main room, the crowd went into a frenzy, cheering uncontrollably. Upon arrival, the Marquee staff surprised LeBron with a celebratory presentation at his VIP table with a parade of Ace of Spades. The NBA all-star took in the rest of the night with his friends and danced along to each song as DJ Vice manned the decks. Also enjoying the party was fellow Cavaliers teammates Kyrie Irving, Dahntay Jones, Tristan Thompson, Channing Frye, Richard Jefferson and Jordan McRae as well Clippers star Chris Paul, Detroit Pistons player Kentavious Caldwell-Pope and Phoenix Suns rookie Tyler Ulis. Comedian Pauly Shore was also at Beauty & Essex Monday night having dinner with a group of friends.